The Camino has brought me so many incredible experiences and the blessing of meeting wonderful and genuine people. My heart and life have been forever changed from the Camino calling me through years of wildly SYNCHRONISTIC events and I am grateful to my spirit, my family, and friends for helping to follow this amazing journey. 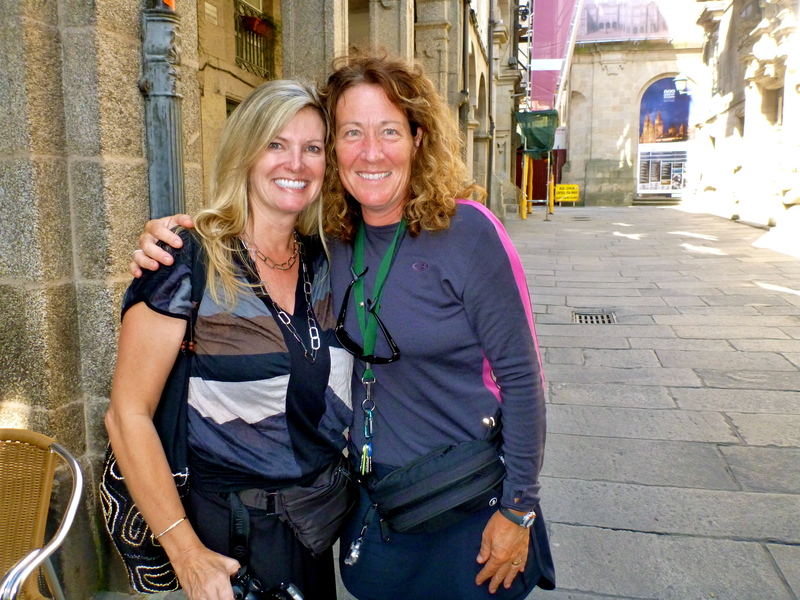 Meeting Ruth Riley through one of my incredible synchronistic experiences while I was in Madrid (in another blog post I will share how it unfolded – Ruth shares a little bit below) we were able to meet just two days later when Ruth was finishing her Camino. We enjoyed an fantastic breakfast at the Parador Hostal Dos Reis Catolicos with a view of the Cathedral just outside our window while Ruth shared some of her passion for the Camino and her travel journeys – it was a very special and memorable day for me. Thank you Ruth for sharing some of your Journey as it is an inspiration to me and I know it will inspire others to make their own Camino Adventure! “When I first heard of “The Camino” I was 38 and my family was young so there would be no way I could get away to do the walk. I thought maybe that would be a good goal for when I turn 50. I never hear about “The Camino” again in any conversation and actually forgot the name of it! 10 years later I was walking in a fundraising walk for Cancer and met a fellow walker and he said he had completed “The Camino”. He told me all about his experiences and of course this got me to thinking again about the pilgrimage! I went home that day all excited and set my goal to do the walk when I turned 50. From that day forward I could not stop thinking about it. As soon as I started talking about my plans I was bumping into people everywhere who had already done it or had a friend that did it. I was at a golf tournament and the prize was a book on “The Camino” so I took all the signs the camino was giving me and said why wait until I am 50, why not go now! I started training right away and set my date for September 2011 (when I was 48). For a person who does not travel this was a big deal!! Some thought I was crazy to go off alone and walk 800km across Spain, but I just knew this was something I had to do. I never once had any doubt that I could not complete it. I was only a day into my walk when I discovered that the head light that I brought was not strong enough so I had to make sure when I headed out in the morning I tagged along with someone with a stronger light. A few days later when I booked into an Alberge I went to my assigned bed and on the pillow was a headlight. I asked all the people around me if it was there’s and nobody claimed it! Lucky me, the camino provided for me. While I was on the camino I missed my friends daughter’s wedding back home. The newlyweds were travelling to Spain for their honeymoon. On their travels the met a women from California that was actually doing a documentary on the Camino and they told her that I was doing the walk. The day I arrived in Santiago de Compostela I received and email from them asking if I would be willing to meet this woman and tell her about my experience on the camino. Within an hour I was meeting Susan Mann. I was so excited and amazed at how the camino connected us, small world. Susan even treated me to a real sit down breakfast that I did not have to walk while eating. Thank you Susan, I totally appreciated your company and generosity. After my return home I was asked to do a workshop on the Camino. I am not one to stand in front of people and present at all but I said yes right away as I have so much passion on the subject. The most exciting thing about doing the workshop was I got to pack my backpack again and put my boots on. My feet were so happy!! Once again I was in my element as I was sharing my journey/pictures on the camino. I am hoping that I pulled it off and that the attendees now have the camino on their minds. While I was preparing my notes all one morning I thought I should take a break and go out for a walk. I live in the country with not many houses around. I walked out my door and there was a person walking by with a backpack! I caught up to him and said “I bet you are training for the camino”. He said yes, he was leaving in May, now what are the chances of that happening (only the camino knows)! “What luck” I said, I am having a workshop next weekend, you should stop by. He attended the workshop now I am just waiting to hear how his trip went. This entry was posted in Camino Inspirations!, Camino Stories & Syncronicities and tagged camino, Inspiration, outdoors, Synchronicity, The Way, traditions. Bookmark the permalink.